James Cochran EC3 offers a bright and airy interior decorated in a contemporary style. Perfectly suited to those looking for something up-to-date with a relaxed ambiance. Its straightforward layout that can be readily adapted to your seating plan. It can comfortably seat 60 and up to 75 if a walking buffet is preferred. This excludes the 16-seat bar area to the front of the venue that can accommodate additional standing guests. The pared-back style also means that the space can be dressed to suit your needs or theme without proving time-consuming or requiring a complex set-up. The professional kitchen can be used if you wish to bring in your own catering on a "dry hire" basis. But, of course, we are able to offer a fully catered and staffed event for you, either drawing on our existing menus or with a specially planned menu unique to your event. Whether a buffet-style with a focus on finger food right through to a seated multi-course tasting menu made with the finest ingredients, we are able to offer top value for quality at an affordable starting price point. Events can sometimes include the hire of BYOC City, located below the restaurant, subject to availability. This can provide space in a unique—and different—setting for an additional 60 to 70 individuals. 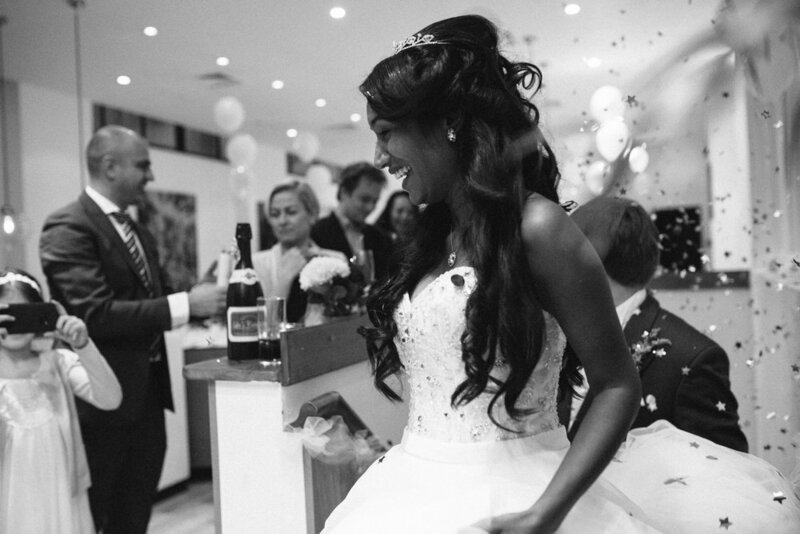 Whether for a wedding or a corporate event, James Cochran EC3 is in an ideal location. A short walk from Liverpool Street Station and Aldgate East Tube Station, it has transport connections across London and beyond, useful if your corporate event is being attended by colleagues from abroad or for a wedding where relatives scattered around the world can easily get to the location with great connections to Stanstead, London City Airport and London Southend. At weekends the area is quiet, usually with very little traffic congestion. Another bonus is that all those quality hotels within walking distance that serve the business community during the week offer excellent weekend deals, allowing your friends and relatives good value for quality if staying overnight. The perfect choice for couples seeking a modern atmosphere with the option of contemporary top-class cuisine at their wedding, James Cochran EC3 is located directly over the road from the oldest synagogue in the City and is within easy walking distance of numerous churches. James Cochran EC3 offers a simple, flexible package for weddings and goes to great lengths to ensure that your wedding is that day to remember for the rest of your life. To receive our full information pack on wedding packages, please contact us. We welcome enquiries from wedding planners and events companies as well as individuals. James Cochran EC3 can offer you a first class launch, company dinner or networking event. Our flexible approach to enabling the events clients want and need has seen us successfully cater to everything from a more traditional "take over" dinner with a focus on culinary quality for City banks to relaxed networking events for specialist sectors. For more details of the services and options we can offer for your corporate event, please contact us.